The question is marry or stay single? 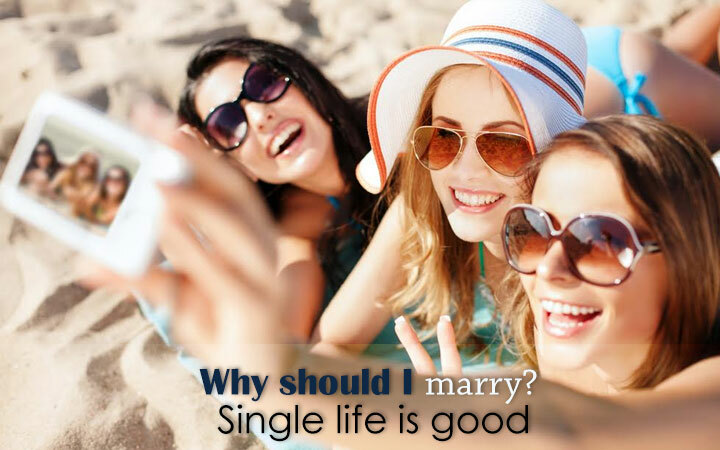 Why should I marry? Single life is good, The fun of being single cannot be discounted. You are free to do what you like, go where you want without any strings attached. But have you thought about your future? However, the question is till when can you live like that? Won’t loneliness and companionship become a need? Health: Most couples stay healthier, happier and enjoy longer lives than singles out there. Women tend to have lower rates of mental ill-health and depression than those living alone. That is because the spouse and family offer emotional and mental support. Wealth: Married couples tend to have more money and savings unlike single men or women. The support system, even if one of them is off work due to any reason can tide over the difficult time better. Additionally, they rely on each other for better investments and pool in the money which makes then financially secure. Children: Children that are raised in stable and happy families tend to perform better at school, complete their education and are more grounded. There are less chances of having behavioral problems, lower chances of emotional and mental health issues. They tend to form better in social relationships and have a positive attitude towards long lasting marriage. When you look at the benefits of being married vs. staying single, it is better to get married, have a stable and loving family than coming back home to a lonely home. If you actually think about it, you do miss the love and warmth of coming back home to a happy and laughter-filled home.